Amazon Hypes Its Kindle Success Without Actually Naming Any Numbers. Again. Unsurprisingly, Black Friday was pretty successful for Amazon, which is shipping out Kindles at a staggering rate. As usual, though, we have no idea what that rate is. You dark horse, Amazon. 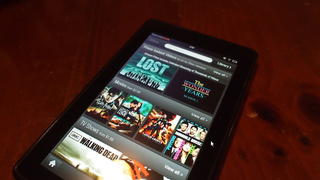 "Even before the busy holiday shopping weekend, we'd already sold millions of the new Kindle family and Kindle Fire was the bestselling product across all of Amazon.com. Black Friday was the best ever for the Kindle family – customers purchased 4X as many Kindle devices as they did last Black Friday – and last year was a great year." Way to go, Dave! What an amazing truck load of hyperbole with pretty much zero substance that statement is. No doubt they're going to do fairly well today, too — it being Cyber Monday. Still, hyperbole aside, at least there's no talk of them running out of stock yet, so if you haven't got your loved one a Christmas Kindle yet — is there anyone who isn't getting a Kindle this Christmas? — you don't need to worry.